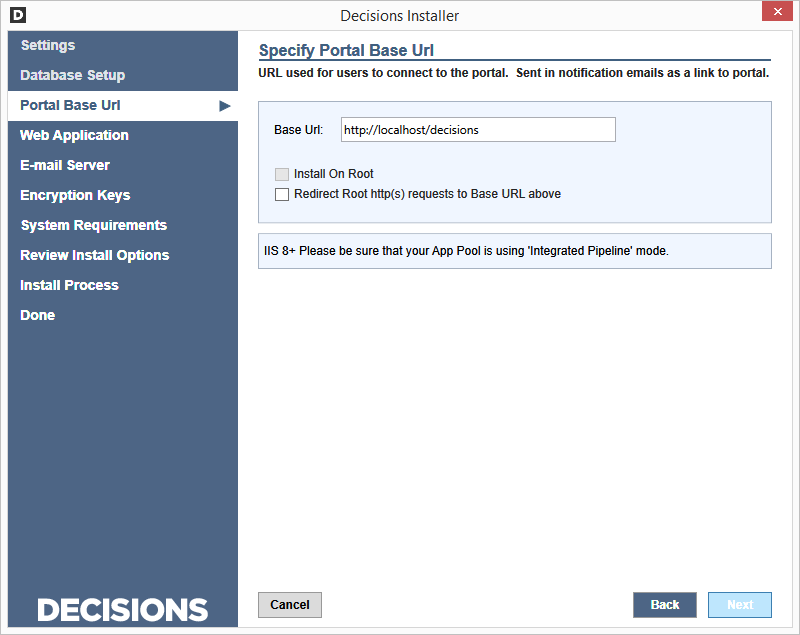 This document steps you through installing theDecisions Platform	on an App Server or PC. 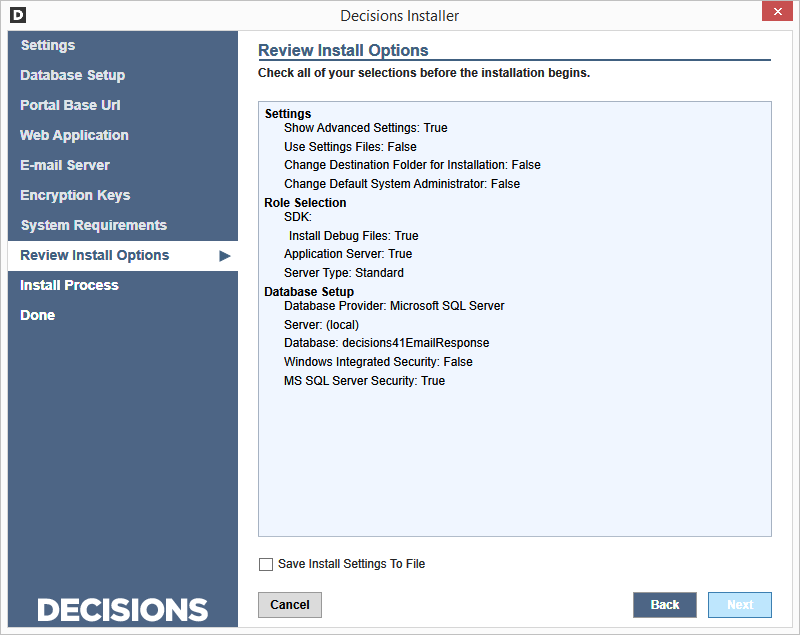 Decisions requires a database and in this guide we will use SQL Server (for other database options, see the Advanced Installation documentation category). Microsoft SQL Server Express is suitable and the easiest to get started. It can be downloaded here . For recommended Installation Requirements please visit this article: Installation Requirements - Self-Hosted Environment. NOTE: Do not have the Services dialog open during installation otherwise an error could occur. Open the installer executable to begin the installation wizard. In the first step - Installation Type - click the Install	button. 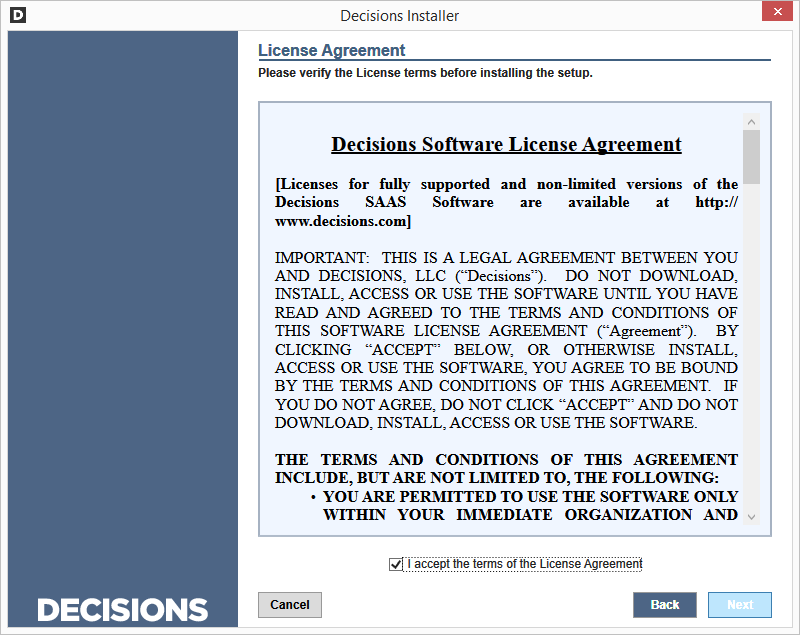 After reading the license agreement, select the I accept the terms of the License Agreement	checkbox, and click the Next	button. This is the most common type of server installation and can be used in production (live) or non-production (development) settings. Use this server type when you want to be able to log into the server from other machines, to allow others to log into the server (for example, for QA cycles), and to publish your flows. This server type is strictly a local installation. Use this server type when you want to build and test Flows, Forms, Rules, Reports, and Pages, but you do not intend to publish them. This server type also does not let other machines log on. This server type is identical to the Standard Server except that it is not live until it is triggered. Use this type to install a failover server that will be available but will not run jobs or events on startup. This server type stores entities and manages versioning. It does not run live applications. Install Emergency Password Reset Too	l – installs command line tool that can be used to reset user passwords in Decisions . 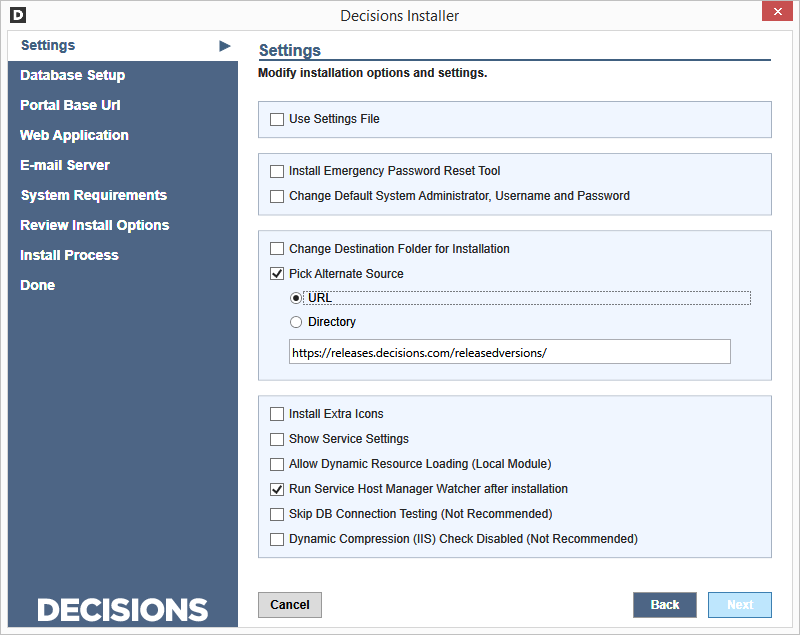 Change Default System Administrator, Username and Password	– option to change default Decisions “admin@decisions.com”:”admin” credentials. 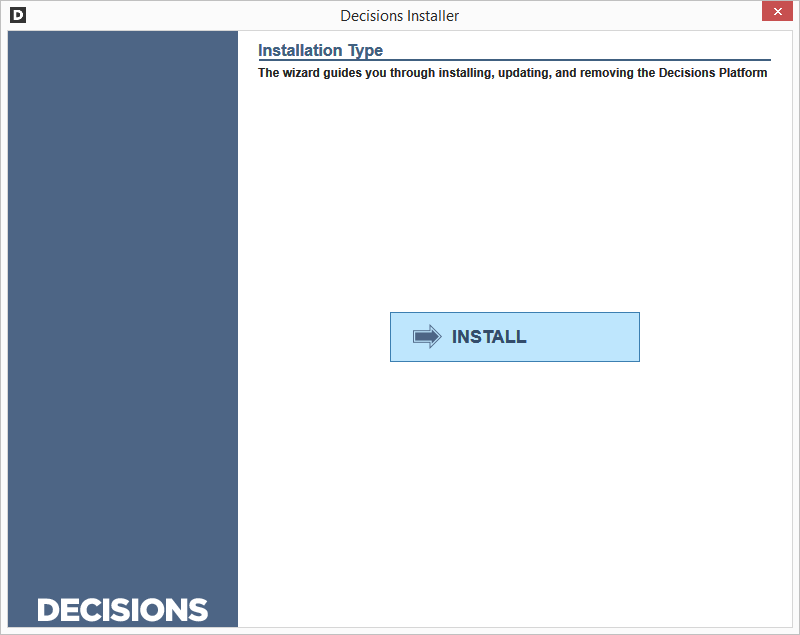 Change Destination Folder for Installation	- By default, the Decisions software is installed to C:\Program Files\Decisions . If desired, change this location by enabling this setting and browsing to the desired installation location. Pick Alternate Source	- Enables either a URL or directory to select for the installer files. Install Extra Icons	- Enabling this setting installs the image library of icons available for use (which can be used as icons for items posted to the Service Catalog, for example, or to represent published workflows) . Images are installed to C:\Program Files\Decisions\Images by default. Show the Service Settings	- Enabling this setting makes it possible to customize the user name/password under which the Service Host Manager Service will run. Allow Dynamic Resource Loading (Local Module)	– allows system to store and load sources from Local Module. 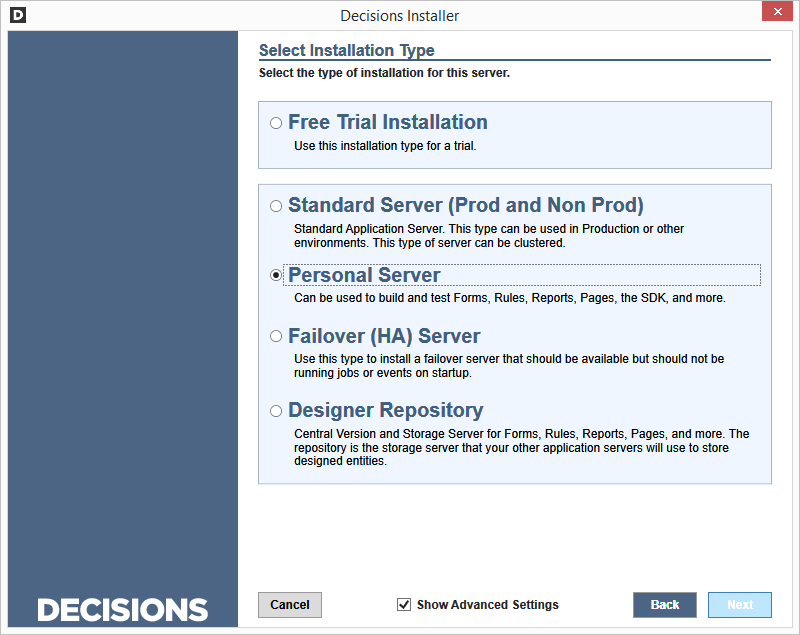 Run Service Host Manager Watcher after Installation	- If enabled, the Host Manager Watcher service will run after installation. This is the process that can start and stop the &apos;Service Host Manager&apos; that the Portal depends upon, as well as watches and restarts it if it stops for any reason. Skip DB Connection Testing (Not Recommended)	– skipping database connection test in Installation wizard. Dynamic Compression (IIS) Check Disabled (Not Recommended)	– disables installer to checkIIS Compression. 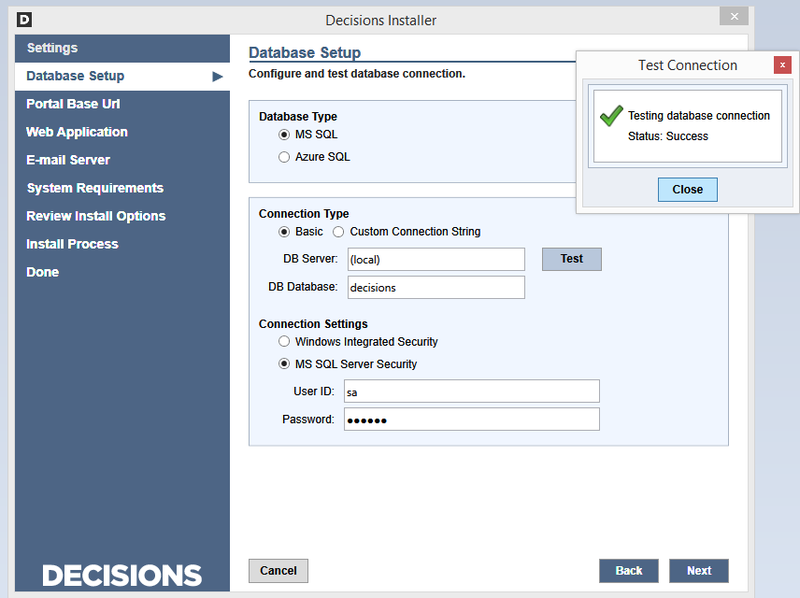 Under Database Setup, Database Type	, select the MS SQL	option. Under the Connection Type	, select Basic	or Custom Connection String	and fill in the DB Server	and DB Database	fields with the server location and name of the database. If the database does not exist, Decisions OS will attempt to create it. To test these connection settings, click the Test	button. Under Connection Settings	, choose the option for Windows Integrated Security	to enable database connection authentication using Windows Integrated Security, or MS SQL Server Security	to enable database connection authentication using a specified username and password. Note:	to learn more about difference between Windows Integrated Security and MS SQL Security please visit this article: SQL Server Database Permissions . To continue installation, click Next	. Fill in the Base Url	field with the URL where users will go to access the portal. To redirect all requests for the root host to the portal URL, select the Redirect Root http(s) requests to Base URL above	checkbox. 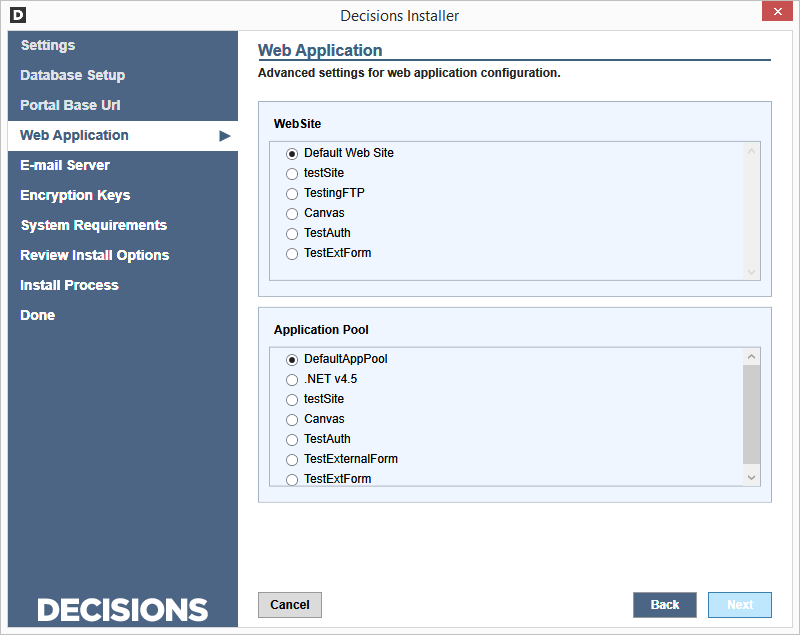 In the Web Application	screen, under Web Site	, select the site in IIS under which Decisions will install. Also, select desirable Application Pool. For many standard features to work, Decisions OS requires access to a mail server with which it can send email. To configure a connection to an SMTP server, select the SMTP Server	option and fill in the required connection fields. 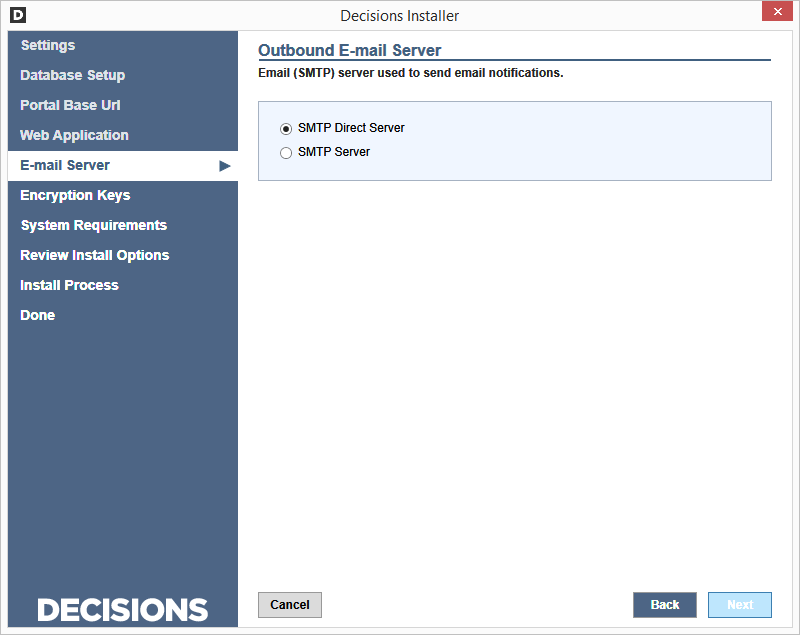 To configure this connection later, or to configure Decisions OS to look for an SMTP server running on the local machine, select SMTP Direct Server	. 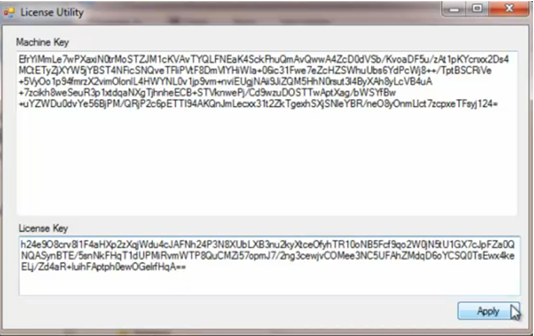 In Encryption Keys	window we can restore database encryption keys from the file. NOTE: The account that is provided here must have proper rights to run as a service. To add these rights, go to Administrative Tools > Local Security Policy > Local Policies > User Rights Assignment	. Edit the item "Log on as a service" and add your domain user. 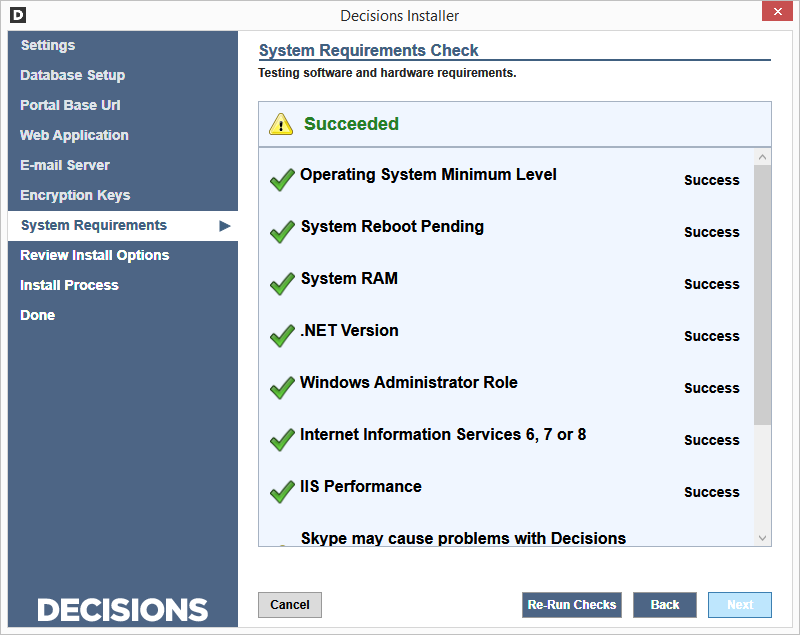 When all of the system requirement checks have successfully completed, click the Next	button. The installer will list the configuration settings for this installation. To save these installation settings for future reference - such as in the event a reinstallation or recovery - select the Save Installation Settings to File	checkbox. Click the Next	button. 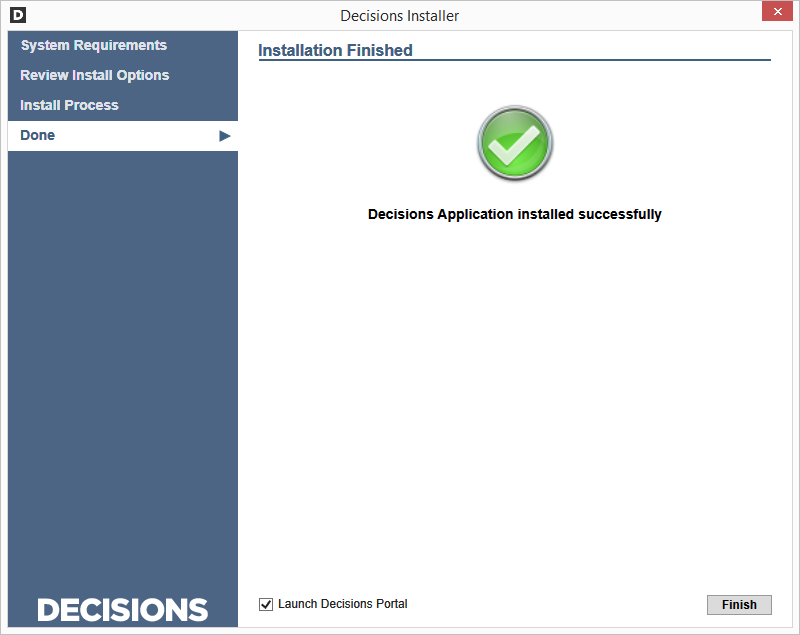 The installer installs Decisions OS instance. As part of the process, the installer will automatically download, register, and configure any required third-party services or utilities. As this is happening, you may click the Show Details	and Hide Details	buttons to toggle a report of what&apos;s happening behind the scenes. When the installation is complete, the installer displays a completion message. 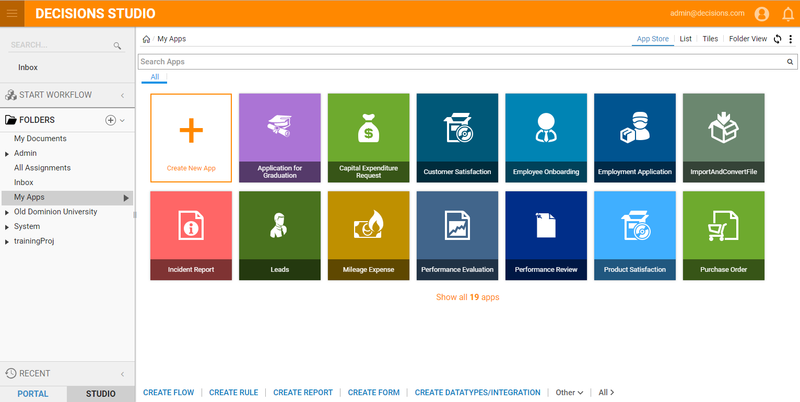 Click the Finish	button to close the installer and open portal; use the admin credentials that are provided on the screen to log into the portal. 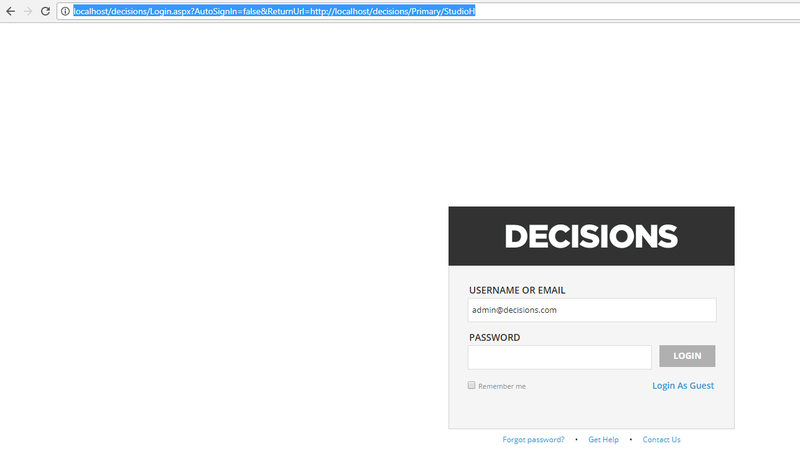 After clicking Finish you are being redirected to the login page. Mention, if Decisions system was installed on local machine we can see localhost/decisions/... in the browser&apos;s address bar. If we were using different address to install Portal we would see something like 192.168.1.3/decisions/... in the browser&apos;s address bar. Note:	For the HTML Portal you must open the port configured in settings for SignalR and the next port after that. Computers can be licensed to run the platform with third-party plugins or with the built-in licensing mechanism - License Utility	. 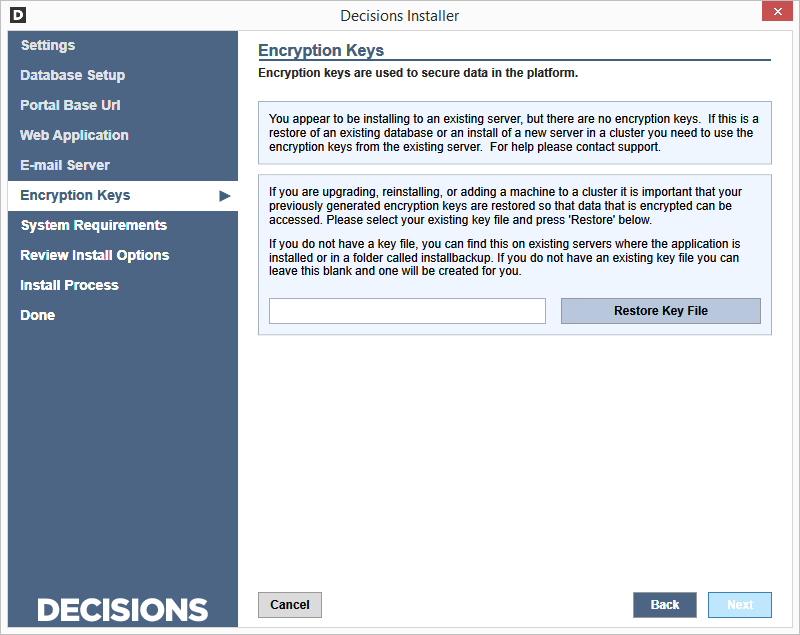 To license a machine using License Utility	, open the executable and email the Machine Key	it generates to "support@decisions.com". Our tech support team will respond with a license key which can be cut and pasted into License Utility	and applied to generate a license key file. You must run the utility as an administrator, otherwise you will not be able to successfully apply the license key. Our example assumes that the platform has been installed in the default path. To access the license utility, navigate to the folder C:\Program Files\Decisions\Decisions Services Managerlicensing. Run the LicenseUtility.exe. The License Utility dialog box appears. License Utility	generates a unique string for this machine in the Machine Key	field. Select the string in the Machine Key	field and copy it to your clipboard. Paste the machine key into an email and send it to your contact for generating licenses. Using the machine key you&apos;ve provided, your license key will be generated and provide it to you. 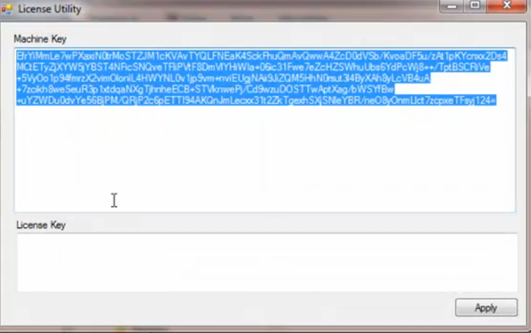 When you receive the license key, in the License Utility	, paste the license key into the License Key	field. A pop-up alert will notify you when your license key is due to expire. Click OK.	After updating the license, restart the Service Host Manager.